Gives you a Bible Scripture for each day of the year for powerful Bible scriptures to learn and apply. Read 366 Bible scripture promises and write in this binder on how you will apply these in your life! Love Faith Journal is for your to take 5 minutes a day to read the scripture for the day and then write out in the binder in the spaces provided! 8.5 " X 11" X 0.5 " high, regular paper size in 3 ring binder. Scriptures are in the Bible WEB Version. You can go to www.biblegateway.com to compare your Bible version to this to get more insight. 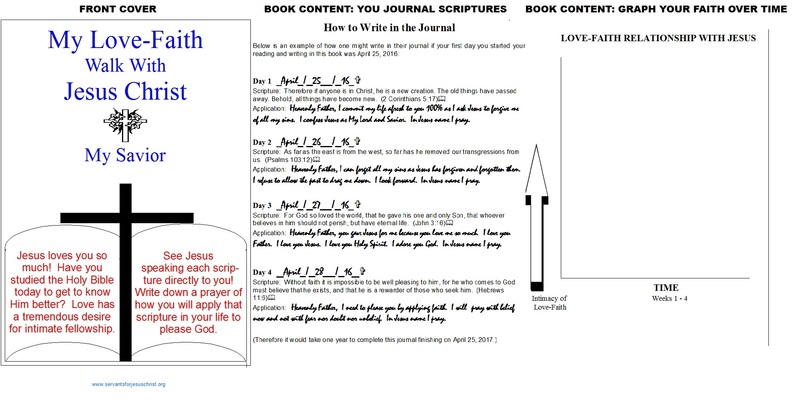 Is a 75 page hardcover binder helping people to see how their love-faith relationship with Jesus is progressing by writing out scripture applications (1 for each day of the year) and drawing sketches of their spiritual growth.